Hours: vary summer and breaks. NOTE: Due to long printing times, Poster Printing and Large Format Scanning are not possible in the last 30 minutes before closing. Please arrive at least an hour prior to closing to assure your print is completed before the Service Desk closes. Note: Color printing is not available from Selected Resource computers. Go to: MSU Print: Using Web Print, or ﻿MSU Print﻿. Ask staff at the Main Library Patron Services Desk. Ask staff at the Main Library Reference Desk. 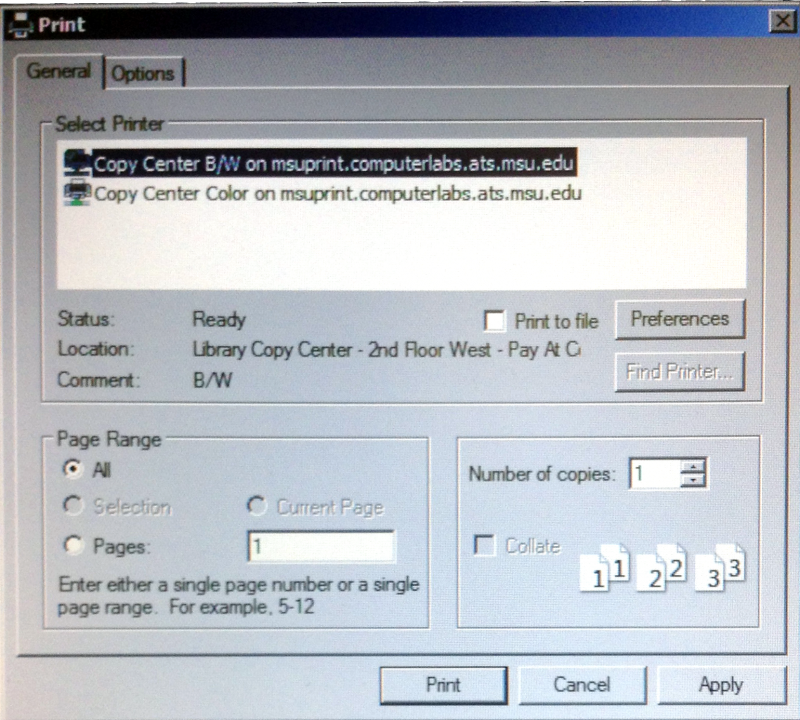 Click on the MSU Print icon on the desktop to select and upload items to print. You will go to: MSU Print. and login with your MSU NetID. From your application, select the print option to open the Print Dialog box. print single-sided, you must change the setting under the Preferences button. Choose the Black & White, or Color printer. Then click Print to send it to the MakeCentral print queue.